This playground's focal point is the sculpture Group of Bears, a work by renowned artist Paul Manship. It is also commonly referred to as Three Bears. The sculpture sits on a stepped platform, surrounded by a large circular seating area at the entrance to the playground. Manship's other works in Central Park include the Osborn Gates at Ancient Playground and the Lehman Gates at the Children's Zoo. 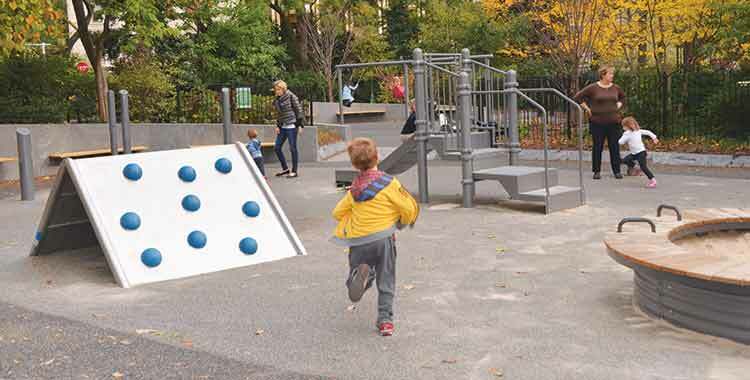 Features:The playground was completely reconstructed in 2014 as part of the Conservancy's Plan for Play. The renovations added all new infrastructure and play features, including bucket swings, a climber, a slide, and sand box, all geared towards younger children.